Supermicro® Launches a Wide Range of HPC SuperServer, Storage, and Networking Solutions with the Latest Intel® Processors and Intel Omni-Path Fabric; Plus GPU and NVMe All-Flash Storage Technologies. The Comprehensive HPC Solutions Include Intel® Xeon Phi™ processors (formerly code named Knights Landing) based 2U 4-node SuperServers for HPC clusters and workstation for developers, 2U Dual-port 40-NVMe All-Flash Super-SBB (HA-in-a-Box) SuperStorage with up to 5Tb/s aggregated throughput in a 42U rack for Lustre solution, 8-Way System with 24TB Memory Capacity for high computing and memory density, and Intel® Omni-Path fabric based 100Gb/s Networking Switch for high-speed interconnect. Supermicro latest innovations in HPC architectures and technologies including a 2U 4-Node server supporting new Intel® Xeon Phi™ processors (formerly code named Knights Landing) with integrated or external Intel® Omni-Path fabric option, together with associated 4U/Tower development workstation; 1U SuperServer® supporting up to 4 GPU including the next generation P100 GPU; 7U 8-Way SuperServer with 24TB memory capacity supporting the new Intel® Xeon® processor E7-8800 v4/v3 product families and up to 8 Intel® Xeon Phi™ coprocessors or GPU cards; All-Flash High-Availability-in-a-Box SuperStorage 2U 40-Bay dual-port NVMe system with dual node “Simply Double” based storage exhibiting up to 5Tb/s throughput and over 1.28PB storage capacity in a 42U rack; Lustre High Performance File system; and 1U 48-port top-of-rack network switch with 100Gbps Intel® Omni-Path Architecture (OPA) providing a unique HPC cluster solution offering excellent bandwidth, latency and message rate that is highly scalable and easily serviceable. SuperServer supporting Intel Xeon Phi processor All with integrated Intel Omni-Path Fabric 2U Rackmount and 4U Tower Solutions – Supermicro’s Intel® Xeon Phi™ processor-based computing platforms. In conjunction with Intel Xeon processors, the Intel Xeon Phi processor forms a compelling tag team that utilize common instruction sets and support multiple programming models, helping to make it easier to manage parallel computing applications in the hybrid environment and take advantage of the powerful processing resources of Supermicro’s HPC platforms. Engineering, scientific and research fields can dramatically accelerate application performance with minimal investment in development with Supermicro’s Intel Xeon Phi processor-based supercomputing solutions. Hybrid platforms support latest Intel® Xeon® processor E5-2600 v4 and v3 product families. The 2U SYS-5028TK-HTR is the most optimized Intel Xeon Phi processor system in the market, supporting 4 Knights Landing processors with no preheating. The 4U Tower SYS-5038K-I is intended for designers wishing to develop applications for this exciting new processor/networking option. 2U 40 Dual-port NVMe All-Flash SuperStorage Solution 2U A 2U 40 dual-port, dual-controller, all- NVMe system supporting up to 30GB/s per system throughput via Intel 100G Omni-Path networking, unrivaled in the industry. Benefits include largest improvements in throughput (up to 12x) and latency (up to 7x), shared common backplane that improves flexibility of drive choice, 2.5” U.2 (SFF-8639) form factor for improved hot-swap serviceability vs. PCI-E Flash cards, and improved power efficiency. 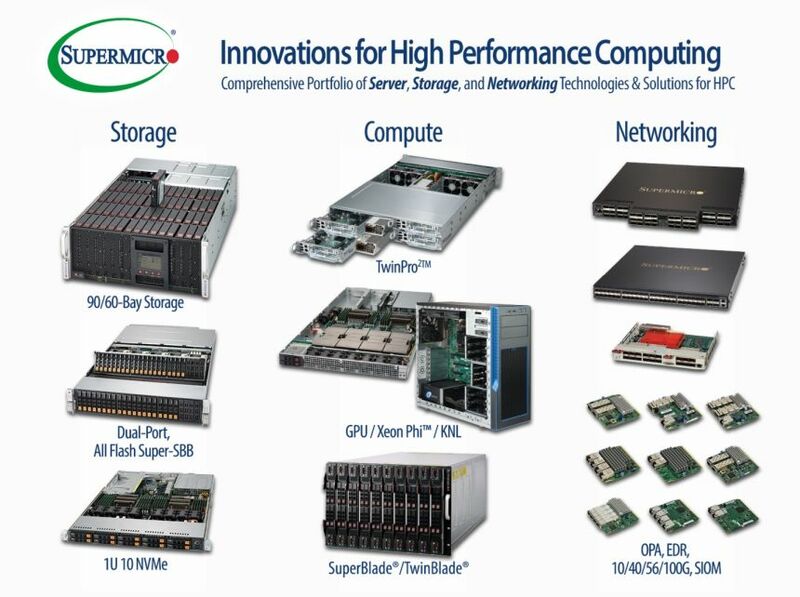 Supermicro server solutions with NVMe target HPC, Energy, 3D modeling and graphical design, HFT, Database, Search Engine, High Security Encryption, and VDI in cluster and supercomputing applications; in Cloud, Virtualization, and Enterprise environments. Simply Double SuperStorage 2U Solutions offer up to twice the storage capacity and IOPS in the same amount of space of traditional 2U front load storage systems. Second set of drive bays are arrayed in a patented Riser Bay located on the top of the Simply Double systems for easy access and servicing. Available in 2.5″ or 3.5″ drive bays, and that also support All-Flash NVMe SSDs or SAS 3.0 HDDs. Feature two additional rear 2.5″ hot-swap drive bays, 3 PCI-E 3.0 slots, redundant Titanium Level (96%+) power supplies, and support for Intel Xeon processor E5-2600 v4/v3 product families. SuperServer supporting GPU All Accelerator with next generation architecture-based Solutions – Supermicro’s Enterprise-class High Performance SuperComputing solutions are available in the industry’s broadest form factors and highest density (1U, 4 next generation P100 GPU SYS-1028GQ-TXR/-TXRT) generating massively parallel processing power and unrivaled GPU peering via 80GB/s NVLINK for Machine Learning applications. 8-Way (MP) SuperServer 7U Latest generation Supermicro 8-Way multi-processor (MP) system features up to 192 CPU cores and 192 DDR4 memory DIMM slots. Eight CPU modules and 2 storage modules are located in the front of the system with each CPU module supporting Intel® Xeon® processor E7-8800 v4/v3 product family with QPI up to 9.6GT/s, 24 DDR4 memory DIMMs, (total 192 DDR4 DIMMs for complete system), 1 PCI-E 3.0 (x16) (GPU supported) or optional 2x 2.5” hot-swap U.2 NVMe. 2 storage modules each supporting 6x hot-swap 2.5” HDD/SSD, 3x 3.5” HDD or optional 10x 2.5” HDD/SSD, and 1 PCI-E (x8 in x16) and optional RAID card. Chassis supports 5 rear hot-plug FHHL PCI-E 3.0 (x8 in x16) modules, SIOM expansion with 4x 10GbE and 1x 1GbE IPMI ports, and 5 redundant (N+1) 1600W Titanium Level high efficiency (96%+) power supplies. Solution is optimized for mission-critical workloads in scale-up HPC, in-memory computing, and large-scale virtualization. SuperBlade® 7U Advantages include maximum density with 20 DP nodes in 7U, affordability, reduced management costs, lower power consumption, optimal ROI, and high scalability. Modules support latest Intel® Xeon® Processor E5-2600 v4 product family and are available with 20 Intel Xeon Phi coprocessor or GPU Blades; 2 coprocessor cards per blade server (SBI-7128RG-X/-F/-F2), 3 GPU per blade server (SBI-7127RG3), Data Center Blade (SBI-7428R-C3N, SBI-7428R-T3N), TwinBlade® (SBI-7228R-T2F/-T2F2/-T2X), Storage Blade with NVMe support (SBI-7128R-C6N) solutions. Chassis feature industry’s only hot-swap NVMe solutions, hot-plug switch modules supporting InfiniBand FDR/QDR, 10/1 GbE, FCoE, chassis management module (CMM) and redundant 3000W/2500W/1620W (N+1, N+N), hot-swap Platinum Level digital power supplies. 3U/6U MicroBlade 3U & 6U Designed for best advantages over many industry standard architectures with all-in-one total solution, ultra high density, ultra low power consumption, best performance per watt per dollar, high scalability, and best ease of service. The MicroBlade enclosure can incorporate 1 Chassis Management Module, and up to 2x 10/2.5/1GbE SDN switches in 3U or up to 2 Chassis Management Modules, and up to 4 SDN Switches in 6U for efficient, high-bandwidth communications. It can incorporate up to 4 or 8 redundant (N+1 or N+N) 2000W/1600W Titanium/Platinum Level high-efficiency (96%+/95%+) power supplies with cooling fans. MBI-6119G-C4/T4 – 28 Intel® Xeon® processor E3-1200 v5 product family nodes per 6U (up to 196 nodes per 42U) or 14 nodes per 3U with 4x 2.5″ SAS SSD, RAID 0,1,1E,10 or 4x 2.5” SATA HDD. MBI-6219G-T – 56 Intel® Xeon® processor E3-1200 v5 product family nodes per 6U (up to 392 computing nodes per 42U rack) or 28 nodes per 3U with 2x 2.5″ SSD per node. MBI-6118D-T2H/-T4H – 28 Intel® Xeon® processor E3-1200 v4 product family and 4th Generation Core™ i3 product family nodes per 6U (up to 196 computing nodes per 42U rack) or 14 nodes per 3U with Iris Pro Graphics and 4x 2.5″ SSD, RAID 0,1. 1U Ultra 1U SuperServer supporting 10 NVMe drives – Designed to deliver unrivaled performance, flexibility, scalability, and serviceability that is ideal for demanding Enterprise workloads. Supports Intel® Xeon® processor E5-2600 v4 and v3 product families (160W/up to 22 Cores), up to 3TB of memory in 24 DIMMs, SATA3 with optional SAS3 and 10 NVMe support for increased storage bandwidth. These systems generate up to 12x IOPS, 10x efficiency, and 6x price/performance of systems using standard SAS3 SSDs. Network Switch the latest in cost-effective Top-of-Rack Ethernet switching technology, whether it be traditional fully-featured models incorporating both hardware and software in a complete solution, or bare metal hardware capable of running third-party software configurable to specific customer needs in an Open Network Environment. The SSH-C48Q is a 100Gbps 1U 48-port top-of-rack switch based on the Intel® Omni-Path Architecture.